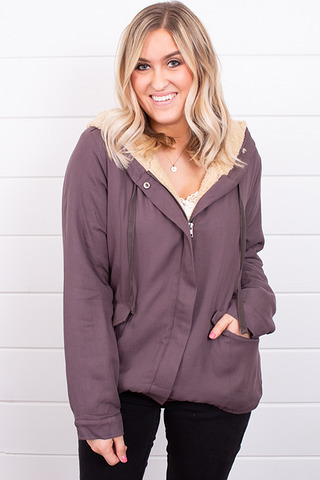 The Paytyn Plush zip-up by Mystree is a super soft piece that you will want to slip into all the time. It has great detailing including a color block patter with cream, light pink and mocha brown. This jacket also has a shiny gold metal zipper and draw string at the bottom making it the perfect fit for anyone. Pair it with leggings or jeans and sneakers for the perfect fall look. 100% polyester Hand wash cold and hang to dry.